MOTIVATED SELLER! Spectacular unobstructed Biscayne Bay views from one of Brickell's largest terrace, your own outdoor living and dining room. 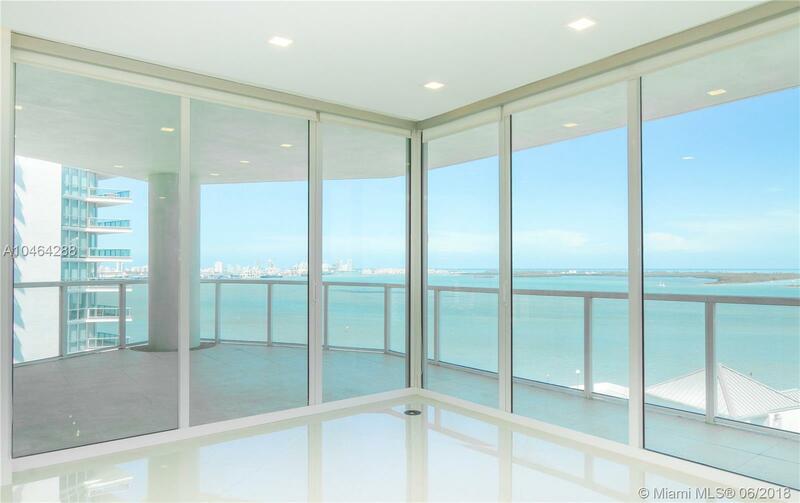 Incredible glass wall views of the Port of Miami, Key Biscayne, Fisher Island and the Miami Skyline. High floor, very large (1594 SF) Corner 2 bedroom apartment with 2 1/2 baths. Brand new high end renovation with top of the line appliances. Other apartment features include high impact windows and sliding doors, dropped ceiling with built-in designer Led lighting, large walk-in closet, utility closets, washer/dryer. Second bedroom has its own balcony. Extra large closet can also be used as a Den. Resort style amenities include rooftop infinity pool, fitness center, sky club, business center, valet parking for guests and much more.